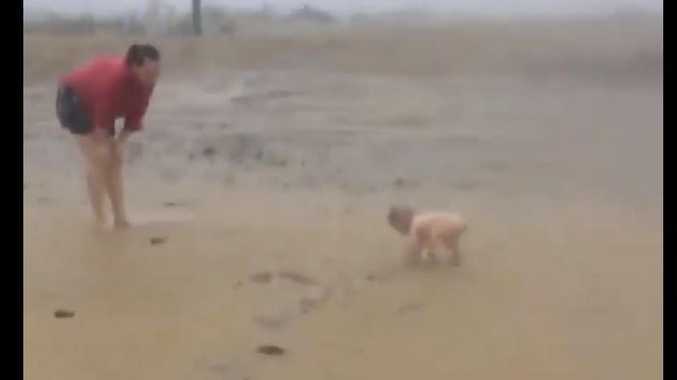 It was less than a fortnight ago that grazier Nigel Simmons pulled out his iPhone and filmed his wife laughing and smiling as she circled their young daughter Viv, standing in the mud stark naked and having the time of her life playing in her first Queensland rainstorm. Growing up on Clarafield Station, in the state's remote and arid north west, little Viv had never experienced a proper downpour. And when that shower rolled through at the end of January, one farmers in the region had waited seven years for, the little girl had the time of her life. Two weeks on, that January monsoon that had drought-stricken farmers breathing a sigh of relief still hasn't stopped - and their happiness has turned to dread. 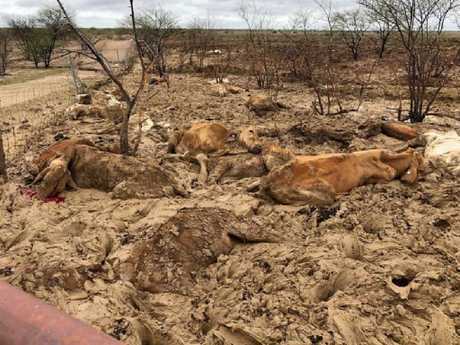 After managing to keep their cattle alive for seven years, through one of Australia's worst droughts in history, farmers were instead forced to watch their herds wiped out in a matter of days after unprecedented floods devastated much of Queensland. If the cattle have not drowned or frozen to death in the elements, devastated farmers now face having to kill thousands of animals. The situation is so terrible that there are reports the farmers have run out of bullets. Some farmers are estimating almost 100 per cent stock losses while the state's cattle industry as a whole is expecting about 500,000 dead cattle. Graziers typically sell cows for $500 a head with farmers estimating the 500,000 dead cattle could mean losses of up to $300 million. ‘We just couldn't get the machines to get them out in time. The tears are rolling as I write this, I love these animals and can't bear to see them suffer unnecessarily,’ Jacqueline Curley wrote. Nigel Simmons and his young family estimate they've lost around 2000 to 2500 cattle from a herd of 3600. Speaking to news.com.au, Mr Simmons said the past two weeks had been "devastating" for outback Queensland. "People out here don't mind flood damage to the roads and fences when we get the benefits of good rain. The stock losses are what hurt us the most," he said. "We will have a lot of road damage, and fences to fix due to flooding. But I'm lucky to have a big family for support, they will come out to help when the roads are dry enough. "We are a bit of a proud and tough bunch, and many of us certainly don't look for hand outs. We just battle on and get the job done." Most families in Queensland's northwest, especially those around Julia Creek, Mount Isa and Cloncurry are stranded on their cattle stations after floodwater washed away roads. The Simmons family's cattle station is 100km down a dirt road, one that's been destroyed from the floods. "We are still unable to drive anywhere," Mr Simmons. Animals killed by floods at Julia Creek. 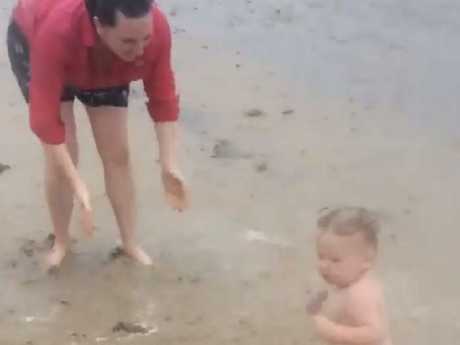 The trip to Julia Creek normally takes the Simmons family around an hour and 20 minutes but the roads are still too wet to drive more than a few kilometres. "Today I had a chopper out and we flew some hay out to cattle that are too weak to walk through the boggy paddocks, and the grass is very slow to get started, so they still have no feed. So they are still dying," he said. "Every day is getting better with the grass growing, and the ground drying out more. In terms of what we have lost, it is purely cattle, which is devastating. "Hopefully late this week we may be able to venture into town. But it will be at least a month or so before we can fix the roads enough to start trucking replacement cattle in. That's if there is no more rain." 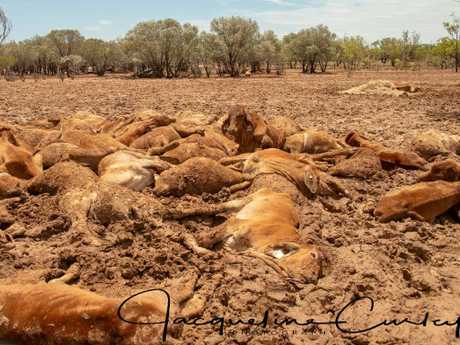 Horrific images have surfaced of the crisis Queensland's farmers are dealing with as they find thousands of their already starving cattle dead. They've also been forced to shoot thousands more as the wind chill and constant rain has left them too stressed and cold to survive. "It's quite a sickening sight to see our beloved animals suffering," Mr Simmons said. 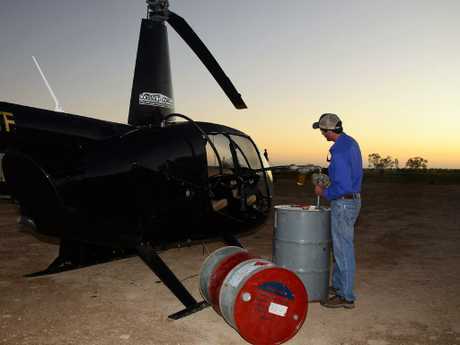 "I have only used a helicopter to check on my cattle, we could get a helicopter to town, but it's quite expensive, and we are in no desperate need of anything." 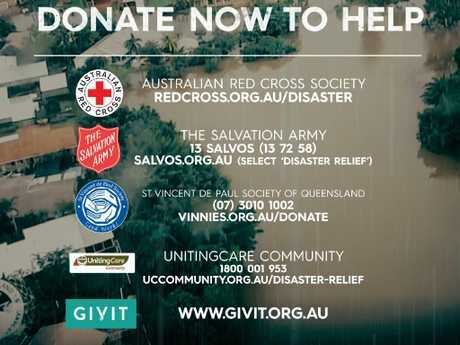 Prime Minister Scott Morrison announced yesterday he would be providing an immediate $1 million to all flood-affected councils to use at their disposal. Mr Simmons said the council in Julia Creek had been wonderful. "The council is great out here, if anyone needed medications or food they would organise to fly it out," he said. "I could of put a grocery order in and they would of brought it out for us when they came out but we are in no urgent need of anything." Mr Simmons said he was grateful the council in Julia Creek was so helpful because of how pricey flying the helicopter was. "A small chopper could carry just one person, or my wife with our daughter on her lap. It would be about $400/hour. We would be about 45 minutes to town. We normally have to pay the ferry time for them to fly out to us also. So a return flight would be around $900. Hence why we would only do it if it was an emergency or something very important." Exhausted graziers have been left with a grizzly clean-up after receding floodwaters in north Queensland left behind hundreds of thousands of rotting cattle carcasses. But it's not the bodies lying in swampy paddocks or the plague of vermin that may come to feed on the dead livestock that concerns them most. 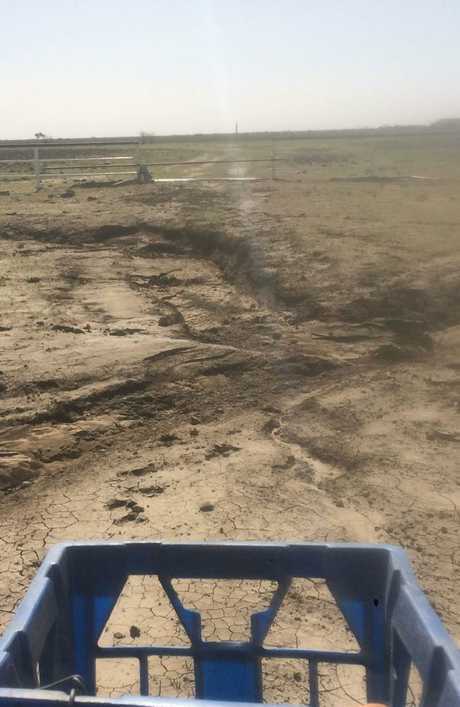 It's the massive financial impact many flooded farmers are likely to be hit with after an unprecedented two-week weather event dumped more than a year's rain on large swathes of the state. On Eddington Station, near Julia Creek, where about 2000 cattle died, Rachael Anderson said the loss of so many animals will affect the station's ability to survive. "We (won't be able to) get loans because we've got nothing to borrow against, none of us have got anything left," she told the AAP. "I can provide for my family right now. But in six months time or when the bank comes for their repayment, I don't know what I'm going to do." The rotten stench has well and truly set in on Ms Anderson's station, but what farmers will do with their dead livestock is still being worked out. "There are feral pigs that will come and eat that, there are feral cats that will come and eat that, and there will probably be a plague of them after this," she said. The financial hit to farmers in the state's northwest and the industry more broadly may not be known for weeks but it's expected to be hundreds of millions of dollars. Some rural properties remain underwater, making it hard for those graziers to get feed to their surviving animals. Heartbroken farmers are now faced with having to kill off the thousands of animals they devoted years to keeping alive. Jill Richardson, another grazier from Cloncurry, told 2GB's Alan Jones about their horror. "The daunting moment was when the chopper pilot runs in with tears in his eyes and says, 'We need more bullets', you know we're in trouble," Ms Richardson said. "A friend of ours, they've lost 5000 weaners (eight to 10-month-old cows), they literally can't find them. We just found a hundred cows dead on the ridge. All the calves are dead. "The ones that are alive we have to shoot because when they find these islands, the dirt just turns to soup and they just literally just drown. "They haven't seen a live kangaroo. When the choppers go out everything is dead. Everything." The sheer devastation has been labelled a national disaster and it has left desperate farmers - facing three years without any income - begging the government for help. "We do not want handouts, but sometimes we do need government financial support when these natural disasters occur. 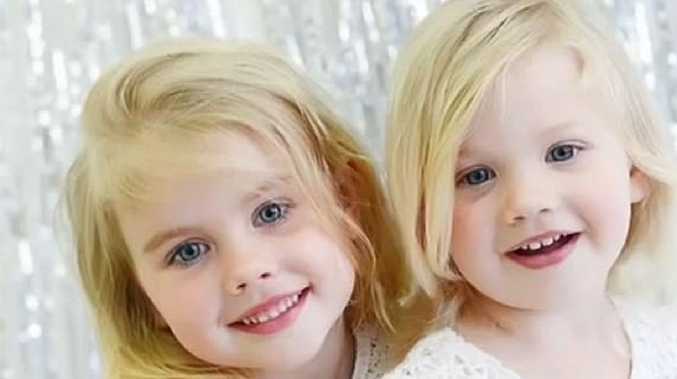 Most of all, we need Australians to buy Australian Products," grazier Jacqueline Curley wrote in a heartbreaking Facebook post shared more than 10,000 times. Most properties are still only accessible by air, forcing farmers to express their heartbreak on social media. "As we begin to access our paddocks, we are being confronted with death and devastation at every turn. There are kangaroos dead in trees and fences, birds drowned in drifts of silt and debris and our beloved bovine family lay perished in piles where they have been huddling for protection and warmth," Ms Curley wrote. The Premier has launched an appeal to help flood-affected Townsville, kicking it off with a $200,000 donation.